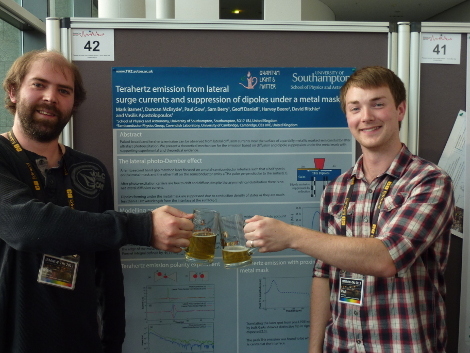 Mark Barnes and Paul Gow toast a celebration to a highly successful poster session. 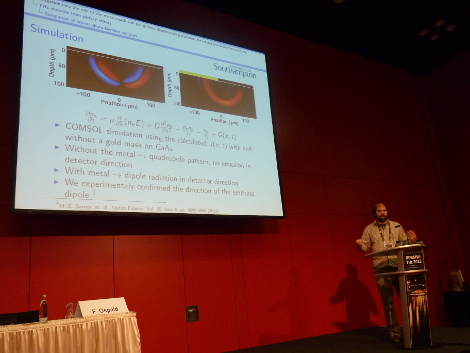 During the first week of September we presented our latest research on Terahertz emitters at the largest Terahertz conference of 2013. Our group attracted a lot of attention with our investigation into the physical mechanism behind the lateral photo-Dember effect, including engaging discussions with prominent figures of the Terahertz research community. At one point during the poster session three members of the group were required at the poster to guide three separate scientists through the poster presenting our research about the driving force behind the lateral photo-Dember effect. Mark Barnes also delivered an oral presentation on the research we published in Optic Express this year (http://dx.doi.org/10.1364/OE.21.016263). Mark presenting his research at the conference.